14 Gram Silica Gel Packet (Tyvek®) is used to absorb moisture and prevent Mold, Mildew, Corrosion, and Fogging. 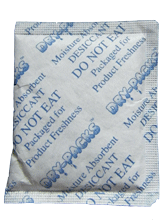 Silica Gel Desiccant 14 Gram Tyvek® Packet (or known as 1/2 Unit) - A unit of Silica Gel is a trade term equal to 28 grams and does not represent the number of packets you will receive. The 14 gram silica gel packets weigh 14 grams, and dimensions are 3.25" in length and 1.5" in width.